Today I'm going to talk about the last 3 books I read and tell you a little bit about them/what I thought. 1. Written In The Stars by Aisha Saeed: I really enjoyed this one! One of the things I like most about reading is experiencing things I don't know anything about. Living lives that are so different than my own. 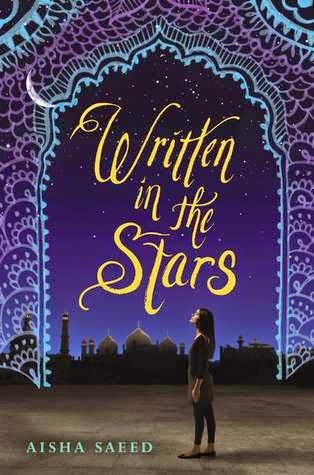 Written in the Stars was about a girl whose family is originally from Pakistan but live in the US. She's not allowed to date or even be friends with males and they believe in arranged marriages. She's been secretly dating behind their backs and is SO CLOSE to being able to spend more time with him as her parents have agreed to let her go to college (where she will room with her best friend and the same college her boyfriend is going to). They find out about the boyfriend and they travel to Pakistan under the pretense of visiting family but really they are trying to find a husband for her right away. It was really interesting getting a glimpse into a cultural practice that I'm not familiar with. It was SO SO hard to know how much she loves Saif and to watch her parents try to marry her off to someone she doesn't choose. Could she learn to love him? Is it her destiny? Can she fight for her own fate? These are all things she explores. 2. 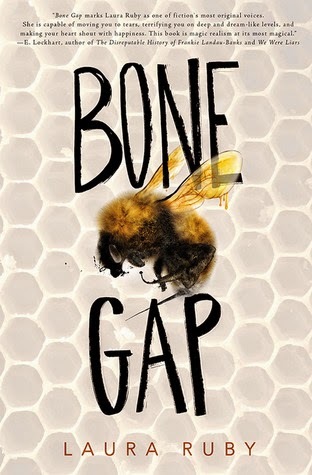 Bone Gap by Laura Ruby: This one was SOOOO unique. Not quite like anything I've ever read. Magical realism? Fantasy? Contemporary with some fantastical elements? I DON'T KNOW. It was just very atmospheric and like a trippy dream in some ways? Bone Gap is an interesting town and the characters are all so eccentric. The mystery thread of Roza's disappearance just kept me turning the pages because the circumstances were so strange and then we got Roza's POV at times and her situation was so bizarre that I just HAD to know what was going on. Also, some major kickass females in this one and an interesting exploration of beauty and society which, I'll be honest, at times I felt like I was not smart enough to follow understand it all. A very literary book that I would recommend to YA readers but also to people who don't read YA. 3. 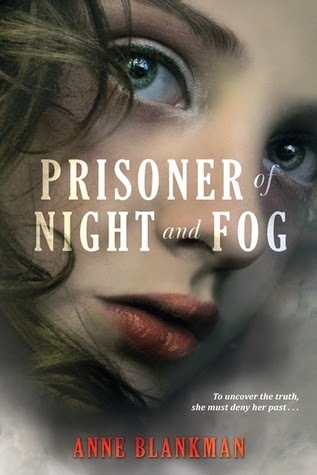 Prisoner of Night and Fog by Anne Blankman: Historical fiction fans! You must check this one out! The setting is Munich in the 1930's. Hitler is not yet in power but he is on his way to be. The main character is a family friend of Hitler, who she refers to as Uncle Dolf, and her family is aligned with the Nazi movement. It's interesting to see Hitler as this person that is beloved by family and friends (though he never ever became likeable to me even humanized a bit). I love that the main character has to question everything she grew up believing when she finds out about a huge lie that has affected her whole life and the person who uncovers this lie is a Jew so she's also confronted with her prejudice against Jews. Her perception of everything she's been told changes and it was so interesting to watch her fight that. This book was INTENSE as she tries to uncover the truth and I cannot wait to the conclusion (it's a two book story though this one really did have a satisfying ending). Written in the Stars is on my TBR. I love the premise for that one. I am so glad you enjoyed it! These books sound interesting, especially Written in the Stars. Wow, Written in the Stars I had never heard of, but it sounds SO similar to something that actually happened with one of my friends. She went to Pakistan and for a while it didn't look like she was going to get to come back! (She did, and got to go to college and everything.) So I'll definitely put that book on my list.